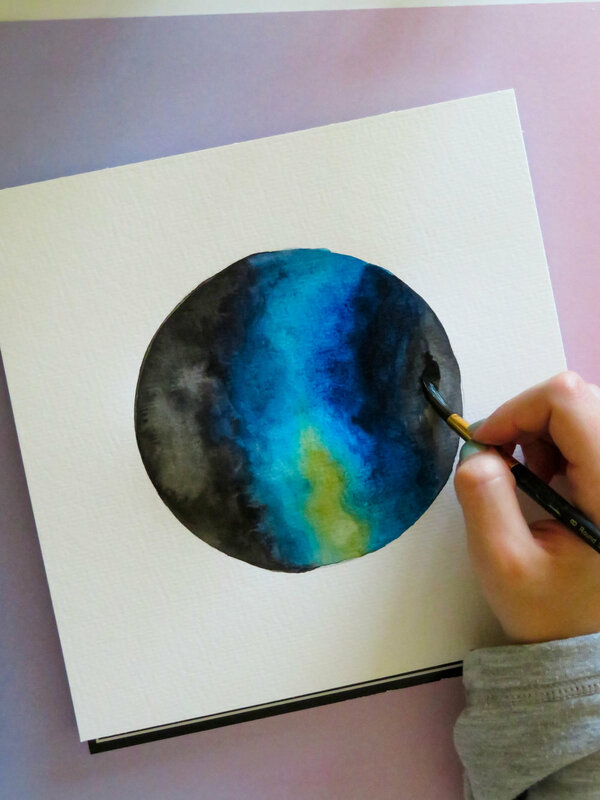 Watercolor galaxies are absolutely mesmerizing to look at, but they can be super tricky to create yourself. After years of experimenting with creating these galaxies, I finally tested a set 'process' for bringing a galaxy to life using watercolors and some acrylic paint. I think I've failed at watercolor galaxies in the past because I was trying to create them in no particular "shape." Recently, I've found huge success by creating my galaxies inside a circle or square shape, so now, I always begin my process by drawing myself a boundary. I took the lid off my coffee canister to outline a perfect circle, cause homegirl can't draw a circle to save her life. The next step is totally up to you, but I like to start with black. 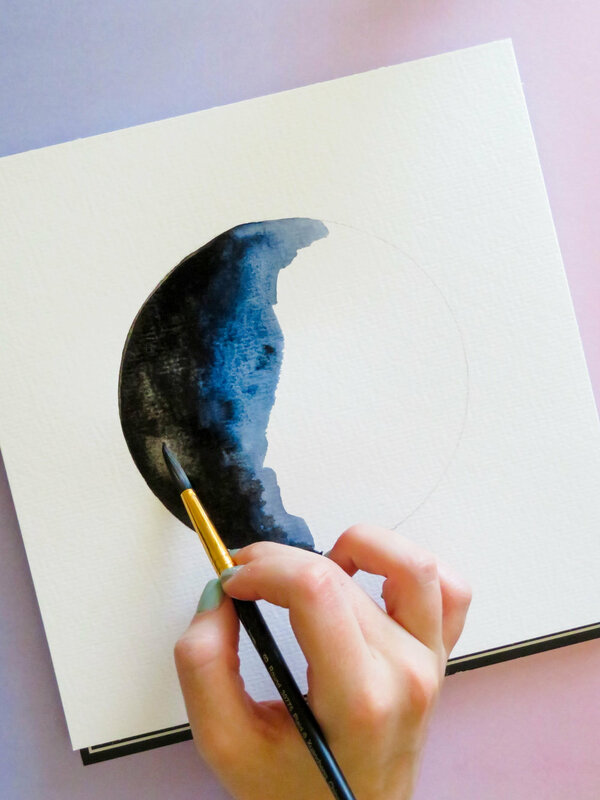 I do a thin patch of watery black pigment and cover the left side of the circle (or shape). If you want your galaxy to be more 'navy' than black, start with navy. After I cover some surface area with black, I go back in to my watercolors and get more pigment. It's best to not add as much water for this step so you can achieve those really intense, dark patches. The dark and light patches create dimension, which is really what a watercolor galaxy is all about! You'll also notice the edge of my first section is jagged and very 'organic.' This is something I do with each 'edge' before I big a new color. I think it helps the transition into another color to look more organic, and like something you'd see in outer space! Next, I moved to navy. Basically, you're going to do the same process. Lay down a layer of watery blue, then go back in and add more concentrated navy pigment in patches to give it some dimension. In the right-hand photo, I'm also trying to smooth out so of the harsh edges between the black and navy by adding a little more black pigment and 'mushing' everything together. Very technical terms, y'all! While the bright blue watercolor is still wet, I dropped in some golden yellow right through the middle. You can skip this step, or use a completely different color like purple, pink, or green. Now that the blue and yellow center is done, I finished the circle by adding a navy layer and a black layer to right, completely filling the circle. At this point, you may be totally done and ready to add in all your stars, some lettering, or whatever tickles your fancy. But, I wasn't crazy about how it looked when it started to dry, so I added some more layers of black and navy! Then, I decided it needed more gold! After adding more gold, I grabbed a small paintbrush, dipped it in water, then used it to splatter white acrylic paint across the circle. And this is when it starts to look like a real galaxy! Now that you've seen the instructions, watch the demonstration video and see the process in video form! I sped the video up by 200%, but you get the gist! The galaxy created in the video is just slightly different, but all the same concepts still apply. I can't wait to see what kinds of gorgeous galaxies you create!